How did literature shape nineteenth-century science? 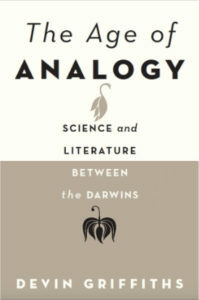 In The Age of Analogy (2016), Devin Griffiths argues that the writing style of Erasmus Darwin and his grandson, Charles, was profoundly influenced by the novelists, poets, and historians of their time. The Darwins, like other scientists of the day, labored to refashion contemporary literary models into a new mode of narrative analysis that could address the contingent world disclosed by contemporary natural science. By employing vivid language and experimenting with a variety of different genres, these writers gave rise to a new relational study of antiquity, or “comparative historicism,” that used analogy to analyze the relation between the past and present, but emerged outside of traditional histories. It flourished instead in literary forms like the realist novel and the elegy, as well as in natural histories that explored the continuity between past and present forms of life. Nurtured by imaginative cross-disciplinary descriptions of the past—from the historical fiction of Sir Walter Scott and George Eliot to the poetry of Alfred Tennyson—this novel understanding of history fashioned new theories of natural transformation, encouraged a fresh investment in social history, and explained our intuition that environment shapes daily life. I originally worked on a much more extensive subject-based index for the book, but had to cut it down for publication. The longer version is here.